Out and about this weekend? This bank holiday weekend, how about going out and walking the countryside and taking photographs of prehistoric monuments? Around Wales there are some fantastic walks, and you will be able to see our past heritage as well. Throughout Wales, and in fact along the European-Atlantic Arc (a region that follows the coastline along the West coast of Europe from Portugal, through Wales, to Scotland) there are thousands of prehistory sites. Many of these are easy to see in the landscape as they are marked by monoliths. The standing stones that are located within Wales may not be as elegant or complete as those at Stonehenge, but they are still impressive structures. Within Wales, Cadw manage and list these sites as Scheduled Monuments. A project, led by Bangor University’s School of Computer Science and School of History, Welsh History and Archaeology, and in collaboration with Aberystwy th and Manchester Metropolitan Universities (funded by the Arts and Humanities Research Council) has been photographing these mysterious landscape features. The team, in fact, wants you to go walking in the countryside and take photographs of these standing stones and upload them to their website. 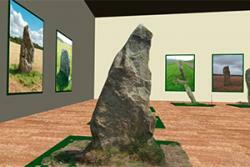 The team will then create three-dimensional virtual reconstructions of these stones. A process of photogrammetry is used to convert several hundred photographs into a three-dimensional model that can be displayed on a computer screen. Pixels are matched between each photograph to gradually build up a three-dimensional picture. These three-dimensional models can then be viewed on the website. 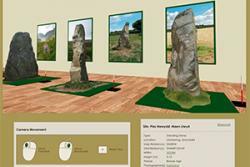 The team has also put together a virtual museum of 20 standing stones that can be explored through a web browser. One of the tallest standing stones in the virtual museum is the 3-metre Bronze age stone at Llandwrog in Gwynedd, another is the Llanfaethlu standing stone on Anglesey, which is a tapering stone 3.1m high by 1.7m wide and 0.4m thick. It is believed that this standing stone was a ritual monument. The team are aiming to create a photographic version of every prehistory site in Wales. Do you know where your local sites are? There are so many standing stones and cairns in Wales, there are likely to be many nearby. Take a look on the map to help you find some sites, and always make sure they are publicly accessible or that you have permission from the landowner. Explore your chosen sites and take lots of photos. Make sure that each photograph is taken from a different position and that each photograph overlaps the previous. You can learn more about how to take suitable photos at heritagetogether.org. Stay safe and remember the Countryside Code: Respect, Protect, Enjoy! If you register for the website, you’ll be able to upload your own photos to be made into models. You can also see other people’s photos and join in discussions on our forum. Why not share your experiences with the team? Once they have enough photos of a site, they can be turned into a 3D model. You can see all of the models made so far in the gallery – help the team to make more of them!